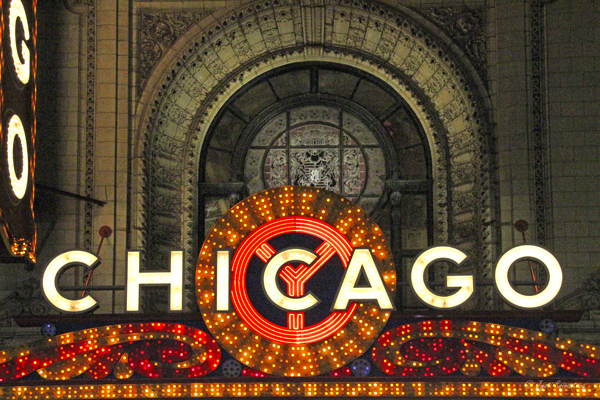 Loop is the commercial center of downtown Chicago. It is bounded on the west and north by the Chicago River, on the east by Lake Michigan, and on the south by Roosevelt Road, although the commercial core has expanded into adjacent community areas. Grant Park is often called Chicago's "Open Front Yard" . This 319 acres of open space has a large number of sculptures, monuments, fountains, gardens. 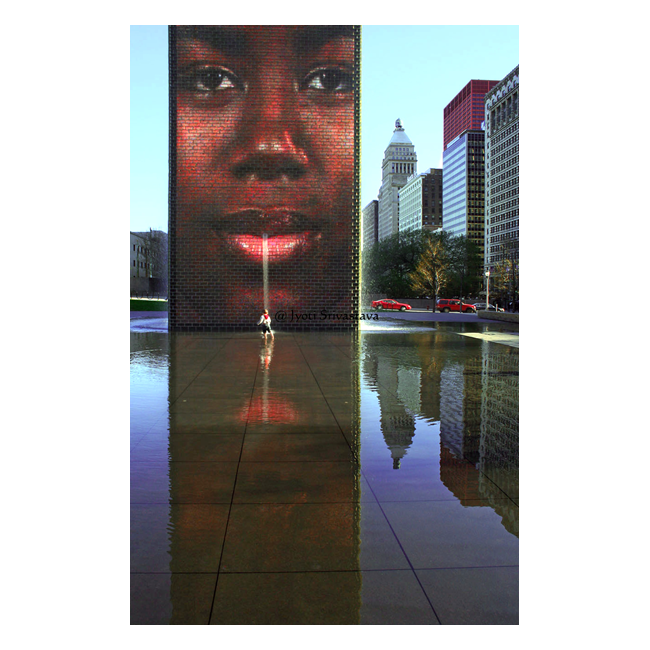 Conceived in 1997, Millenium Park was officially opened in July 2004. 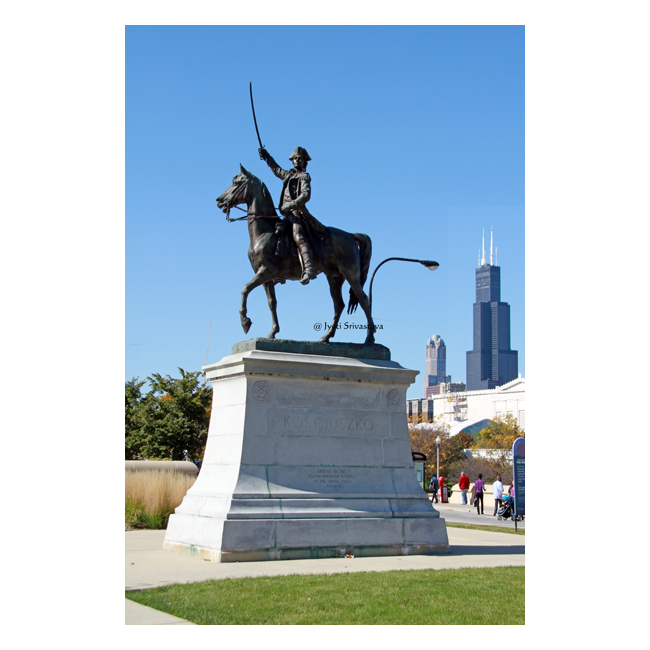 It occupies about 24.5 acres in the northwest corner of Chicago’s Grant Park [319 acres]. This park is actually a garden on a roof-top. It was built to cover railway lines and automobile garage that provided an unpleasant view of the city. 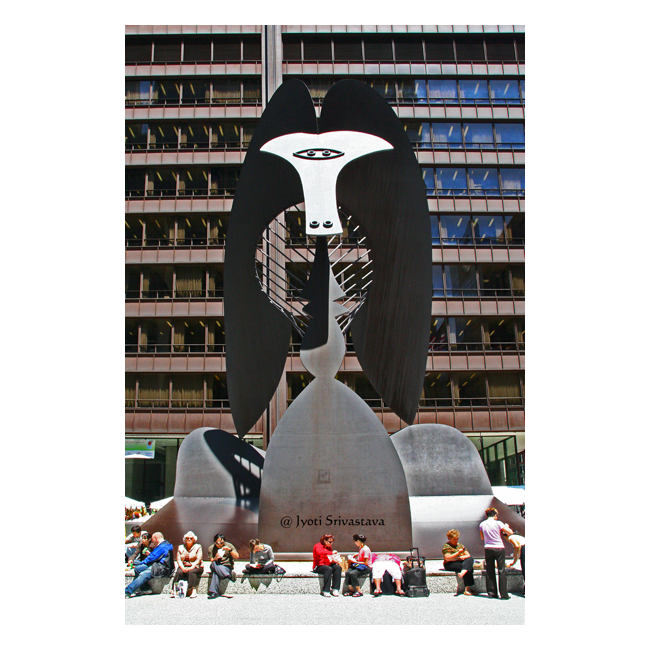 The Art Institute of Chicago is world renowned for its collection of paintings and sculptures. Although there is a fee to enter, there is a whole lot of art in the outskirts with free access to anyone. 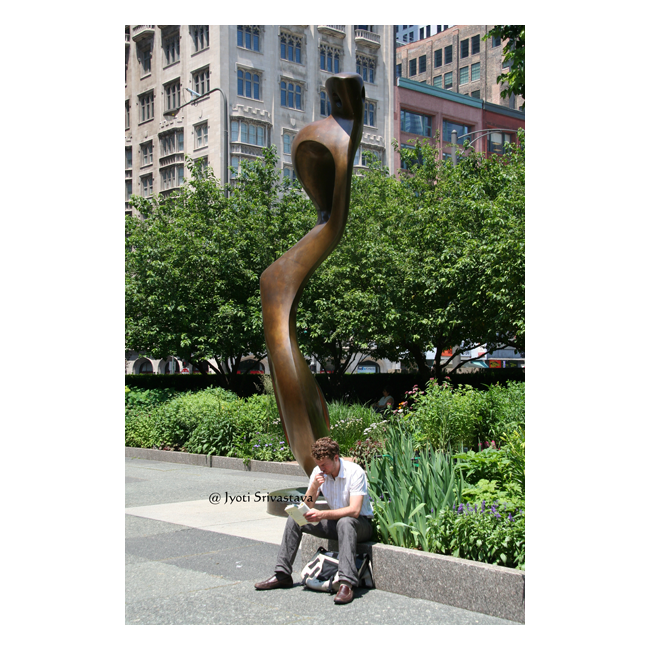 My blog post on Public Art at AIC click here..
Initailly installed in 2004 in Grant Park. 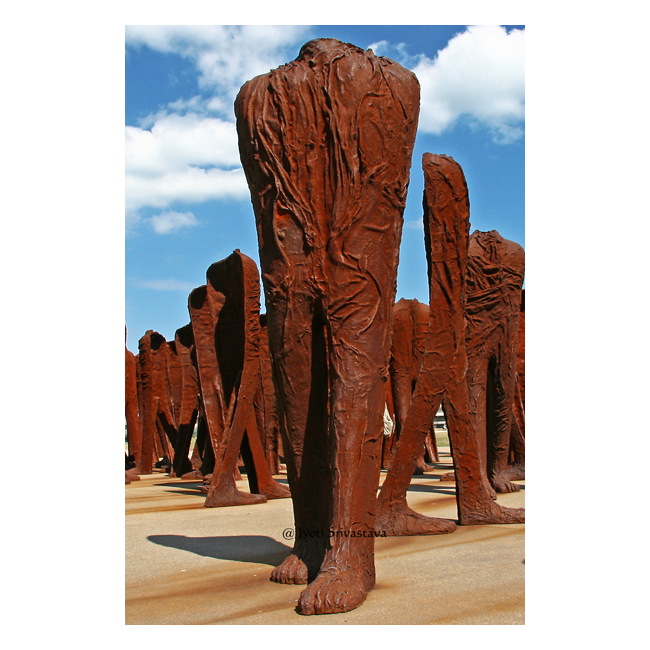 Reinstalled in Northerly Island in 2006. 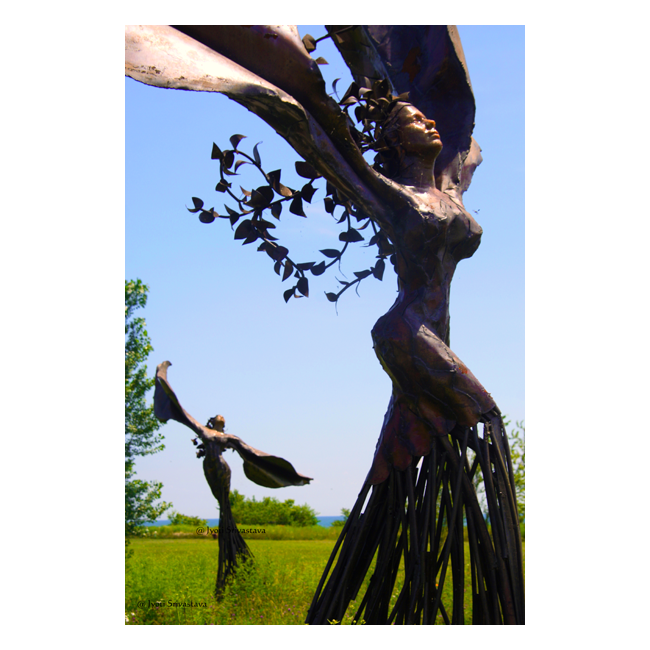 These three figurative sculptures of Daphne are all made from scraps of discarded Cadillac cars. One the the themes of this Chicago based artist of Dessa Kirk, is to find hidden beauty in ugliness. 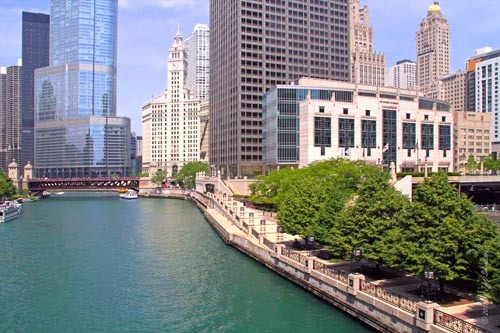 Chicago Riverwalk: The walkway along the south bank of the Chicago River, extending from N Lake Shore Drive to Franklin Street. As such, it runs along the lower Wacker Drive. 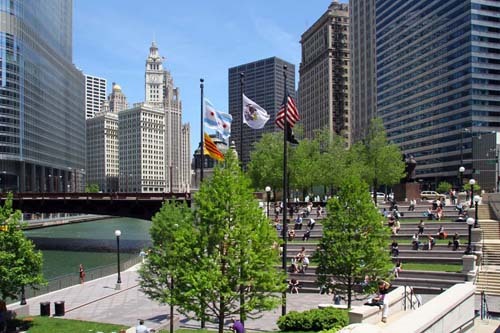 The Chicago River Esplanade is located along the north bank of the Chicago River between Michigan Avenue and the N Lakeshore Drive bridge. It's officially named as "DuSable Founder's Way". It includes a continuous river walkway with a series of landscaped cascading plazas.. The Y-symbol can be found all over the Chicago city, on the bridges, fences and public buildings. It is officially know as the "Municipal Device" and is a symbol of civic pride. So what's the Y-symbol? 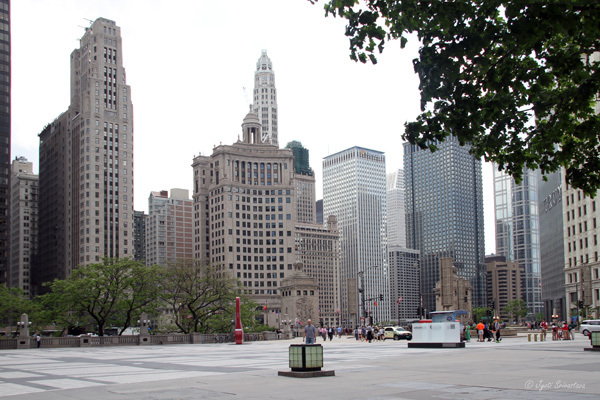 The Pioneer Court is a small plaza located near the junction of the Chicago River and Upper Michigan Avenue in Chicago's Magnificent Mile. It was developed cooperatively by the Chicago Tribune and the Equitable Life Assurance Society of the United States in commemoration of the pioneers who contributed to Chicago`s birth, growth and greatness.